For maps showing our location. GPS address: 21144 Green Lane, Rock Hall, MD 21661. Address not for mailing purposes. 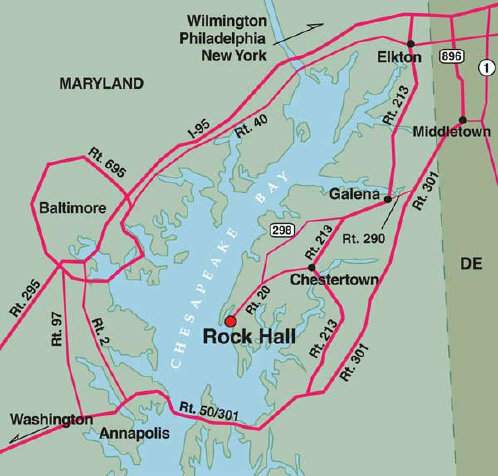 Rock Hall, MD is a quaint fishing and sailing town located on the eastern shore of the Chesapeake Bay. Sailing destinations like Annapolis, Galesville, and St. Michael's are just a day sail away. Students are out on the Chesapeake Bay in just minutes upon leaving the Haven Harbor South marina. Rock Hall is a perfect departure point to explore the entire Delmarva Peninsula. The Haven Harbor South marina has clean bathrooms and showers, a wine and cheese deck, BBQ Grill patio, and a pool where students can relax in the evenings.